Kenneth Robeson is a house name belonging to Street and Smith Publications. The Kenneth Robeson house name was used on the cover of the Doc Savage and The Avenger series. Most of the Doc Savage novels were written by Lester Dent, but other authors who contributed to the series include William G. Bogart, Evelyn Coulson, Harold A. Davis, Lawrence Donovan, Philip Jose Farmer, Alan Hathaway, W. Ryerson Johnson and Will Murray. In addition, The Avenger stories were written by Paul Ernst and Ron Goulart. Notes: Ost was later re-titled The Magic Island . Repel was later re-published as The Deadly Dwarf. According to Plan of a One-Eyed Mystic was shortened to One-Eyed Mystic for its Bantam release. Violent Night was later re-published as The Hate Genius. The Spook Legion was also published under the title of The Ghost Legion. Kenneth Robeson Synopsis: In The Ice Genius by Kenneth Robeson (Will Murray), an archaeologist named William Harper Littlejohn has found a figure from a tomb of ice – easily the greatest discovery of an already accomplished career. Inscribed over the figure is a message that reads “If I Still Lived, Mankind Would Tremble!”. 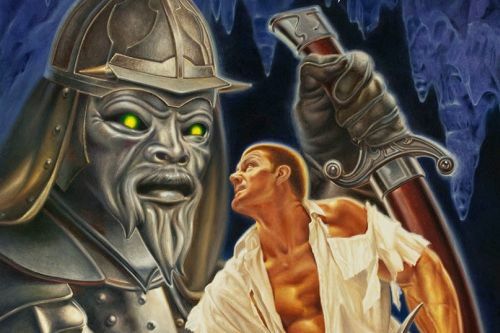 But once he’s broken free from his icy tomb, will Doc Savage be able to tame this monster?